September 27, 2017, 2:30pm. About Me. Yesterday I spent the afternoon at Starbucks Barclay’s Center because Mormon computer gremlins illegally disabled the Jetpack that I purchased from Verizon; I was not able to connect to the internet. I was very hesitant about going to Starbucks. I was not up to having freezing cold air blowing on my body while somebody pressed an easy button laser beam transmitting chills to my body and pain to my head, which happens very often when I go to Starbucks, any Starbucks. Surpringly, I did not experience any torture while I was in Starbucks yesterday. I am glad I was able to connect to the internet last night, here in my room, and this morning because I really did not want to go to Starbucks today. I really want to stay in my room and heal a bit more, nourish my body and rest, before I begin going out again. There is nothing I can do about the easy button laser beam muscular pain in my right shoulder and right arm, extremely painful, even moreso if I turn the electric fan towards my body because of the perspiration dripping from my face. Dr. Peter Dicpinigaitis is Professor of Clinical Medicine at the Albert Einstein College of Medicine, in New York. He is triple-board-certified in Internal Medicine, Pulmonary Diseases, and Critical Care Medicine. He serves as the director of the Medical-Surgical Intensive Care Unit of the Einstein Division of Montefiore Medical Center, and is the founder and director of the Montefiore Cough Center, one of the few specialty centers in the world exclusively committed to the evaluation and management of patients with chronic cough (Figure 1). Peter Dicpinigaitis, MD. Professor of Clinical Medicine, Albert Einstein College of Medicine, New York, USA. (Co-Chairman of the 1st ICC). In addition to experience in all aspects of clinical medicine within the spectrum of pulmonary and critical care medicine, Dr. Dicpinigaitis has been very active in cough-related research. He has authored numerous peer-reviewed journal articles and book chapters on cough, and is considered an international authority on the performance of cough challenge studies in clinical research. He served as a co-author on recently-published cough management guidelines published by the American College of Chest Physicians as well as the European Respiratory Society, and is the founder and chairman of the biannual American Cough Conference (Figure 1). The 1st International Cough Conference was held from November 7 to 9, 2103 in Guangzhou China. The editor of Journal of Thoracic Disease (JTD) has interviewed Dr. Peter Dicpinigaitis. JTD: I have learned that you are triple-board-certified in Medicine, Pulmonary Disease and Critical Care Medicine. Does this medical background make you get more advantages in your research of respiratory disease? Prof. Dicpinigaitis: I am primarily a clinician. My main responsibility is to be the Director of the Intensive Care Unit of my hospital. In the ICU, we take care of the sickest patients, those with respiratory failure and septic shock, for example. My other primary clinical interest as well as my field of clinical research has been in cough. I am founder and director of my institution’s Cough Center, so when I am not in the ICU, I am either evaluating patients with very difficult chronic cough, or working on clinical research projects pertaining to cough. 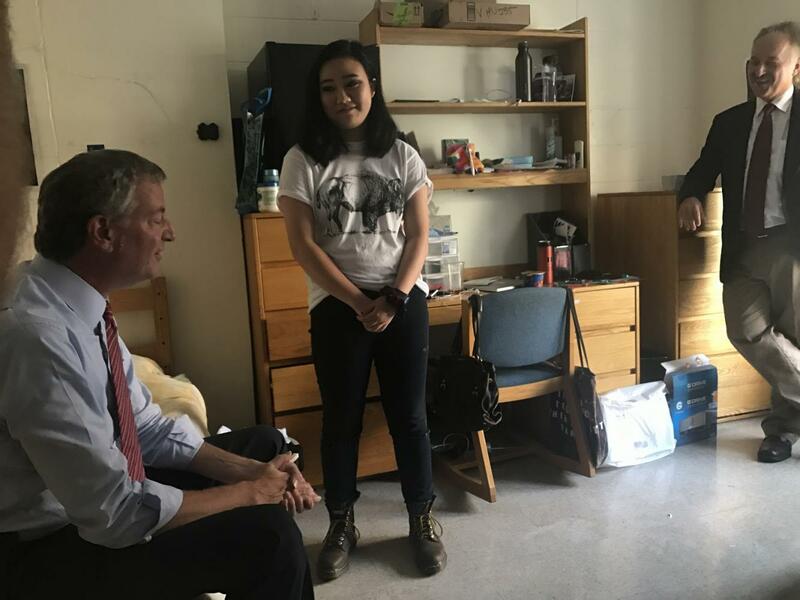 Is Warren Wilhelm aka Bill de Blasio aka Mr. Cleanup Man really a graduate of NYU, or, is he a graduate of Yale University? The Divine Comedy (Italian: Divina Commedia [diˈviːna komˈmɛːdja]) is a long narrative poem by Dante Alighieri, begun c. 1308 and completed in 1320, a year before his death in 1321. It is widely considered the preeminent work in Italian literature, and is seen as one of the greatest works of world literature. The poem’s imaginative vision of the afterlife is representative of the medieval world-view as it had developed in the Western Church by the 14th century. It helped establish the Tuscan language, in which it is written, as the standardized Italian language. It is divided into three parts: Inferno, Purgatorio, and Paradiso. On the surface, the poem describes Dante’s travels through Hell, Purgatory, and Paradise or Heaven; but at a deeper level, it represents, allegorically, the soul’s journey towards God. At this deeper level, Dante draws on medieval Christian theology and philosophy, especially Thomistic philosophy and the Summa Theologica of Thomas Aquinas. Consequently, the Divine Comedy has been called “the Summa in verse”. The work was originally simply titled Comedìa and the word Divina was added by Giovanni Boccaccio. The first printed edition to add the word divina to the title was that of the Venetian humanist Lodovico Dolce, published in 1555 by Gabriele Giolito de’ Ferrari. Hell’s Kitchen, also known as Clinton, is a neighborhood on the West Side of Midtown Manhattan in New York City. It is traditionally considered to be bordered by 34th Street to the south, 59th Street to the north, Eighth Avenue to the east, and the Hudson River to the west. The area provides transport, medical, and warehouse-infrastructure support to Midtown’s business district. Once a bastion of poor and working class Irish Americans, Hell’s Kitchen’s location in Midtown has changed its personality since the 1970s. Though Hell’s Kitchen’s gritty reputation had long held real-estate prices below those of most other areas of Manhattan, by 1969, the City Planning Commission’s Plan for New York City reported that development pressures related to its Midtown location were driving people of modest means from the area. Since the early 1990s, the area has been gentrifying, and rents have risen rapidly. Located close to both Broadway theaters and the Actors Studio training school, Hell’s Kitchen has long been a home to learning and practicing actors, and, in recent years, to young Wall Street financiers. The name “Hell’s Kitchen” generally refers to the area from 34th to 59th Streets. Starting west of Eighth Avenue and north of 43rd Street, city zoning regulations generally limit buildings to six stories. As a result, most of the buildings are older, and are often walk-upapartments. For the most part, the neighborhood encompasses the ZIP codes 10019 and 10036. The post office for 10019 is called Radio City Station, the original name for Rockefeller Center on Sixth Avenue. To the east, the neighborhood overlaps the Times SquareTheater District to the east at Eighth Avenue. On its southeast border, it overlaps the Garment District also on Eighth Avenue. Here, two landmarks reside – the New Yorker Hotel and the dynamic Manhattan Center building (at the northwest corner of 34th Street and Eighth Avenue). Included in the transition area on Eighth Avenue are the Port Authority Bus Terminal at 42nd Street, the Pride of Manhattan Fire Station (from which 15 firefighters died at the World Trade Center), several theatres including Studio 54, the original soup stand of Seinfeld‘s “The Soup Nazi“‘ and the Hearst Tower. The northern edge of Hell’s Kitchen borders the southern edge of the Upper West Side. 57th Street is the traditional boundary between the two neighborhoods. 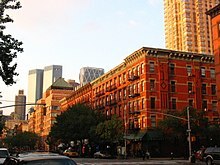 However, Hell’s Kitchen is often considered to extend further north to 59th Street, the southern edge of Central Park starting at Eighth Avenue, where the avenue names change; this neighborhood overlaps with the Upper West Side if this is considered to be Hell’s Kitchen’s northern boundary. Included in the 57th to 59th Street transition area are the Time Warner Center at Columbus Circle, Hudson Hotel, Mount Sinai West, where John Lennon died in 1980 after being shot, and John Jay College. The southern boundary is at Chelsea, but the two neighborhoods overlap and are often lumped together as the “West Side” since they support the Midtown Manhattan business district. The traditional dividing line is 34th Street. 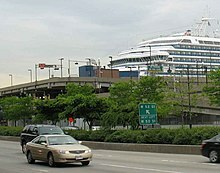 The transition area just north of Madison Square Garden and Pennsylvania Station includes the Jacob K. Javits Convention Center. When, in 1835, Davy Crockett said, “In my part of the country, when you meet an Irishman, you find a first-rate gentleman; but these are worse than savages; they are too mean to swab hell’s kitchen.” He was referring to the Five Points. No one can pin down the exact origin of the label, but some refer to a tenement on 54th Street as the first “Hell’s Kitchen.” Another explanation points to an infamous building at 39th as the true original. A gang and a local dive took the name as well…. a similar slum also existed in London and was known as Hell’s Kitchen. 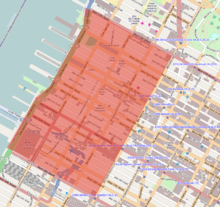 Hell’s Kitchen has stuck as the most-used name of the neighborhood, even though real estate developers have offered alternatives of “Clinton” and “Midtown West”, or even “the Mid-West”. The “Clinton” name, used by the municipality of New York City, originated in 1959 in an attempt to link the area to DeWitt Clinton Park at 52nd and Eleventh Avenue, named after the 19th century New York governor. 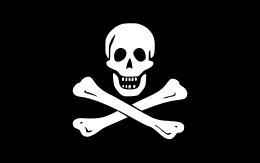 Piracy is an act of robbery or criminal violence by ship or boat-borne attackers upon another ship or a coastal area, typically with the goal of stealing cargo and other valuable items or properties. Those who engage in acts of piracy are called pirates. The earliest documented instances of piracy were in the 14th century BC, when the Sea Peoples, a group of ocean raiders, attacked the ships of the Aegean and Mediterranean civilizations. Narrow channels which funnel shipping into predictable routes have long created opportunities for piracy, as well as for privateering and commerce raiding. Historic examples include the waters of Gibraltar, the Strait of Malacca, Madagascar, the Gulf of Aden, and the English Channel, whose geographic strictures facilitated pirate attacks. A land-based parallel is the ambushing of travelers by bandits and brigands in highways and mountain passes. Privateering uses similar methods to piracy, but the captain acts under orders of the state authorizing the capture of merchant ships belonging to an enemy nation, making it a legitimate form of war-like activity by non-state actors.